We're so glad you are thinking about visiting Calvary! We are a small church with a big heart, located in downtown Lombard across from Helen Plum Library. Parking is around the back, on the street in front (Maple), and as long as it's not a weekday, in the municipal parking lot next door. Our Sunday Services are at 8am and 10am. Our 8am service is more contemplative and without music for those who enjoy finding God in moments of silence. Our 10am service embodies a variety of different kinds of music for those who love worshiping diversely through song! We are a small church with a big heart for others and seek deep and genuine relationships with all those we encounter, regardless of age, faith, race, socioeconomic status or sexual orientation. At Calvary you become part of our family! We have a history of healing ministries and a very active pastoral care outreach team. Our Rector liturgically values tradition and is VERY Episcopalian theologically however, she is rather non-traditional and creative by nature. The Rev. Maureen O’Connor, also known as Mother Mo, is a fun-loving, good humored Irish female priest who strives to make worship relevant for our everyday lives. She has a serious passion for pastoral care, enjoys finding creative ways of building bridges with others in the community, and is not afraid to speak truth to power. For more about Mother Mo, visit Our People. Jason Hill is our Director of Music. He's new to Calvary as of this summer and is already mixing it up with a diverse music selection that is both theologically inspiring and unique. For more about Jason Hill, visit Our People and Our Music. Worship is the most important thing we do together as a church. The structure of our Liturgy dates to pre-Christian practices in the synagogues. 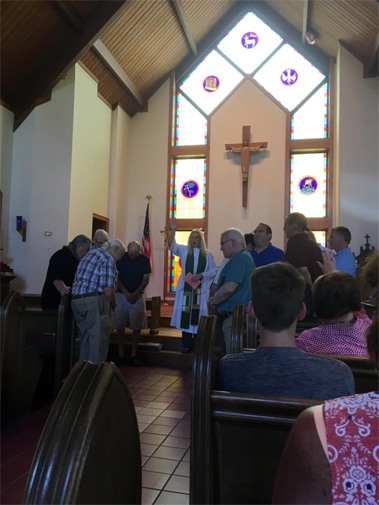 We often use the words given to us within The Book of Common Prayer, but there are other forms of worship that have also been authorized for use by the Episcopal Church, so we are a community that is ancient yet progressive! The Collect for Purity: The prayer said by the Celebrant which names some attribute of God or something God has done, asks for something specific and then closes with praise to God. The Collect of the Day: The collect is written to go along with both the season of the church year and the readings for the day. It summarizes the attributes of God as revealed in the scripture for the day. Four Scripture readings: Following the pattern of Jewish synagogue worship, readings follow a set pattern for what will be read when. Our pattern is to read a portion of the Old Testament, followed by a portion of a Psalm and then a reading from a New Testament epistle, or letter. We stand for the Gospel reading to show the particular importance we place on Jesus’ words and actions. The Sermon: Having someone comment on the scripture readings goes back to the earliest days of Christianity and to the Jewish Synagogue worship which preceded it. Preaching was rare during the Middle Ages, but was put back into a place of honor in the reformation of the Church in the 1500s. Since 1549, a sermon has been required at every Eucharist service. The Creed: Originally the entire service was viewed as our confession of faith. But, since the Sixth Century, the church has recited the Nicene Creed at the Eucharist. The word creed comes from the Latin credo for "I believe." Sometimes we vary between the Nicene Creed and the Apostles Creed. The Prayers of the People: We pray for ourselves and particularly on behalf of others. The prayer book offers different forms for these prayers, but the Prayers of the People always contain these six elements: The Universal Church, its members, and its mission; The Nation and all in authority; The welfare of the world; The concerns of the local community; Those who suffer and those in any trouble; and The departed (with commemoration of a saint when appropriate). The Confession of Sin: We ask God’s forgiveness for things done and things left undone. For those particularly in need of unburdening themselves of past wrongs, private confession is offered. The Absolution: The priest in giving absolution assures us that all who make sincere confession are forgiven by God. Offertory: Holy Communion begins with the offertory. Here we give back to God from the gifts God has given us. That is what is meant by the offertory sentence, "All things come of thee O Lord, and of thine own have we given thee." The Great Thanksgiving: Our offering is the first of four actions in the Eucharist. Just as scripture tells us that Jesus took, blessed, broke and gave the bread and wine, the first of our four actions is for the priest to take the bread and wine. When we gather together we remember Jesus. Through repeating the words and actions of Jesus’ last meal with his disciples, we ourselves join the story and make it our own. This real presence is not the result of a magical incantation on the part of the priest. The gathered community of faith remembering Jesus’ last meal with his disciples and calling on the Holy Spirit to transform the gifts of bread and wine into spiritual food and drink. It is God’s action that makes the Eucharist. The Lord’s Prayer follows in traditional language. This is the ancient connection between our daily bread and the spiritual food we receive in the Eucharist. In the Lord’s Prayer we ask for daily bread meaning the things we need to get through each day. However, the bread also symbolizes God’s presence, which is something that is also essential to our getting through the day. The Celebrant breaks the consecrated bread in remembrance that Christ gave himself for us. Communion is taken by first receiving the bread by placing your right hand over your left and extending it to the priest.Eat the bread and receive the chalice of wine by guiding it to your lips. You may also hold the bread to dip it in the wine. Dipping the bread in the wine and consuming them together is called intinction. Anyone who does not wish to receive communion, may come forward for a blessing. If you do wish to come forward for a blessing, please cross your arms over your chest in an "X" to signify your intention. Post Communion Prayer: We partake in the Eucharist and are spiritually nourished, but it is not for our benefit alone. We offer a prayer up to God realizing that Communion enables us to return to the world with renewed vigor for proclaiming the Gospel in our words and in our lives. In the Eucharist, Christ’s presence both nourishes us and challenges us. Commission Eucharistic Visitors: Some of our communion is set aside each week to take to the sick and shut-ins. We send forth our Eucharistic Ministers to do this task on behalf of the church. The Benediction: The Priestly Benediction, is one of the most ancient texts of the Torah/Old Testament and is probably one of humanity's oldest prayer texts in continual use. The blessings the Priest offers are indeed powerful but they are not magical. On our own, we do not have the power to cause that which we yearn for nor do we have the power to compel God by the force of our invocation. Like our other prayers, blessings are aspirational; we express in word and gesture our deepest yearnings. A blessing is an expression of hope. The Dismissal: As the celebration ends, we are charged to "Go in Peace to love and serve the Lord." The Eucharist is therefore not an exclusive gathering that separates us from the world, but a challenge to reach out beyond our own church to the world around us.